It seems like it was just last week that H went to MEPS and enlisted, however we just past the half way mark till he leaves for BC. Reality is really setting in and I'm just floating through the days now, I don't want to miss him while he is still here, but I find myself doing just that. I think he is starting to feel it too, I get a lot more kisses and he is really enjoying me being rather clingy lately. On a lighter note, I have decided that I am going to need stuffed animals in my bed while he is gone, lots of them...the puppies are too fickle and usually end up on the floor. So I first requested a zebra pillow pet for Christmas...turns out so did everyone else. I have switched it to my birthday wishlist so my mom isn't having to battle moms of 7 year olds to get it for her 30 year old kid...Oh I hope she finds one before March. I think Hello Kitty may invade our apartment in greater numbers than she already has and perhaps I will add more pink as well. I mean whatever makes me happy right? 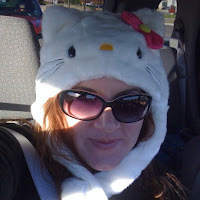 This gift from my mom makes me insta-smile when I put it on, so ya I may wear it for 9 weeks straight, it's like my security blanket, on my head, that I can pet it if I want to, and where I get the idea to make a happy place, I can create a home that no one could be sad in, well unless you are the guy from www.kittyhell.com who has become H's hero. I am hoping for a Hello Kitty toaster or waffle maker for the 9 weeks of living like a single girl again, cold cereal and eggs get old, and ya I will probably eat nothing but breakfast foods, why? Because H doesn't really eat them and so it's things I already cook for one. Oh and I'm not preparing beef while he is gone either...bleh, so maybe chicken and breakfast foods, I really have to learn how to make coffee before H leaves too...good time to start a list huh? Oh I love lists...Eh but enough of that. I love your blog! :) I've been wanting to start a blog. Maybe I will once finals are over. First off, the hello kitty hat is so you! It's adorable! Secondly, how's or how'd the enrolling coming along? I hope you like your schedule! I will come to your graduation and take pictures! Everything must be documented!!! haha!! ps...I have some friends who also have a blog that I comment on and everyone uses special names in place of every person they speak of. everyone uses names that you know who they are just by their nickname, hense "eyes of blue". haha! love you g! I don't know if it's just our guys that do it or many others, but R did the same thing before he left. He bagged up clothes he couldn't fit anymore along with everything else he wouldn't need either in trash bags or in his luggage for storage. He wanted the trash bags of clothes tossed or donated, but after he left I just couldn't do it. They stayed in his little closet until everything got packed up and sent here to OK. I had to take over all of his stuff before he left, too. We didn't/don't have as much stuff to take care of as you guys do, but it was definitely overwhelming for me. Have H teach you everything he can before he leaves. I had post-its everywhere of what to do, when to do it and how. Lists help a Lot when they leave, at least they did for me because I love lists, too. =). R and I are more than willing to help you with ANYTHING you need/want. If we had a two bedroom apartment, you'd be more than welcome to stay here with us, fur babies and all. The coffee won't be hard to do =). If you need any help, call me and I'll talk you through it! Luckily, we have the same coffee maker! hehe! It was hard getting used to him not being home to either annoy me or do the simplest things. The physical aspect didn't even come into light until a month later. I was too focused on the fact that he's not here to do this or that. If H leaves early, you'll be getting Birthday pressies from us early as well! Gotta help with the Hello Kitty invasion! It's going to be hard, there's no sugar coating that, but you've got people to help you through it whether you call or not! As soon as R left, everyone had to force me to get out of the house other than for work. I was a zombie until I became more comfortable with the idea that he was gone. People that haven't gone through this already will still be able to help whether they understand what's going on or not. At first, I thought that since they didn't understand, How can they help me? I think that's why I miss them even more, because they helped me so much through the months of BMT, Medical holdover, more BMT, and the month I could handle of waiting through Tech (obviously I didn't wait long on that hehe). Don't let anyone tell you that moving out for a month or two to be near your husband is stupid. I was called stupid for uprooting my life to spend 2 months near my husband. It was beyond worth it. Also, you and I never would have met! That just would have made it a very boring life indeed! My birthday and thanksgiving would have been sucky without you, H, and the fur babies. It's not just about the birthday of course. You guys letting me invade your home for a few days when I was on my way back home was what I needed. You told me to get up out of bed and stop being a sad panda. It's what I needed that no one else could do (partly because I think they just didn't know I really needed that type of attitude to unfocus on what was going on). Not to say they didn't help, of course! They had their own ways of helping me cope. This reply is turning into a blog of my own! I think I need to dig mine out of the virtual dusty box and start it up again! I have so much in my head! We may be far, but I'm sure we can manage something! Or I depending on if R is deployed! I look at this way, now you have no excuses to not come see me more. A, you'll need to clarify what ya mean about the dependent independent person part lol, I've been called the "married-single girl" forever = ) any chance of hearing someone else's view on this helps me understand myself!